Saladmaster ™ Cookware provides a healthy cooking surface which maximizes nutrition, and saves money, energy and time. It is a high quality product made in the USA since 1946. Saladmaster™ is not sold in stores but direct through a Dealer, Distributor or Authorized Consultant. 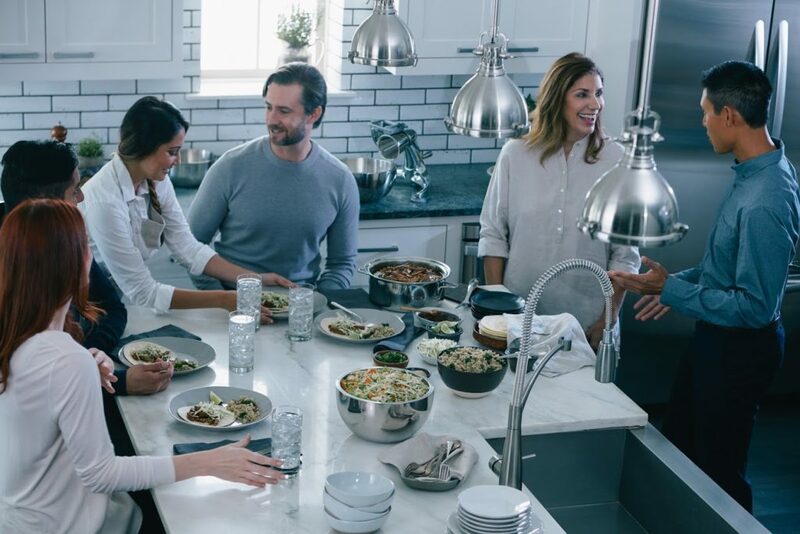 We provide Complimentary Cooking Shows in homes and demonstrate the Saladmaster™ machine and Saladmaster™ cookware while preparing a full meal. One can taste first-hand the non-reactive, full flavor of food cooked in Saladmaster™ 316 Ti stainless steel. Attendees learn about the benefits of Saladmaster™ before committing to invest in a set. Once an owner, you may host future cooking shows and invite your friends, and earn beautiful Saladmaster™ gifts to add to your collection. As a Saladmaster Distributor, book your Saladmaster Dinner Demo today. We start with cooking for one couple or your family. share all the features and benefits of Saladmaster. There is no obligation to buy. This is the way we market our product, through personal demos in homes. Will apply to offset those costs. Saladmaster works on all cooking surfaces; electric, gas, and induction stove tops. This is a free demo and we have lots of fun. It takes about 2 hours. Your Consultant will call to confirm date/time and review what is required; clean and cleared counter space, stove top, clean and cleared since. Consultant brings all food and cookware. Host prepares a buffet with dishes, flat ware and non-alcoholic beverage (water, iced tea, lemonade recommended). Alcohol is not permitted and the reason is that we need everyone to taste the food in it’s pure state. No oil, water or spices are used. This way you get the full benefit of the demo and tasting. Saladmaster is a an investment like an appliance, so we encourage that you make the best of the privilege to host a Saladmaster Dinner Demo for maximim benefit. Consultant brings all the veggies and the meats if non-vegetarian/vegan. I you are vegan, vegetarian, gluten free or have dietary restrictions, please share share this information when you register for a dinner. Dinners will be customized. Your Consultant will leave your kitchen clean and in the order in which it which it was at the start. Crispy Chicken ( no oil, skinned and boneless chicken thighs cooked in the 12” oil core skillet. 110 plug required). Saladmaster Veggie Cake (baked on the stove with the 9” skillet; choose a chocolate or vanilla cake; we use a cake mix, eggs, NO OIL OR WATER and various graded veggied using the Saladmaster Machine/Slicer. Topped with melted Lindt Chocolate if you like. Vegans/Vegetarians; in lieu of the Crispy Chicken we make a veggie lasagna using the 11 gourmet skillet cooked stovetop in 25 minutes; no cheese but includes spinach on top and mushroom as well as cabbage , carrots, and zucchini. We use dry pasta and red sauce. For Gluten free folks, we use gluten free cake mix and if Vegan/Vegetarian, gluten free pasta.